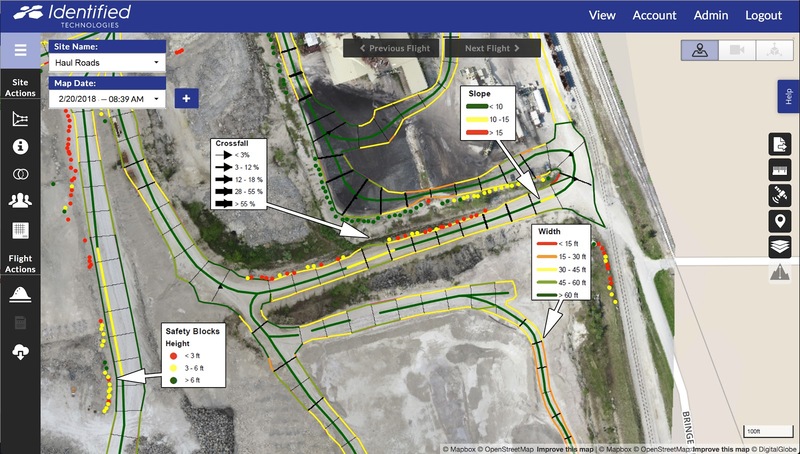 Haul Road Analysis - Allows the user to incorporate mapped haul roads into the orthomosaic they receive when flying their site by drone. This analysis will cover the slope and width of the road. 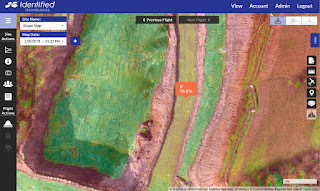 Slope Maps - Enables a user to move a cursor over any point to see the exact slope for that location. It will show slopes by both degree and percent grade. 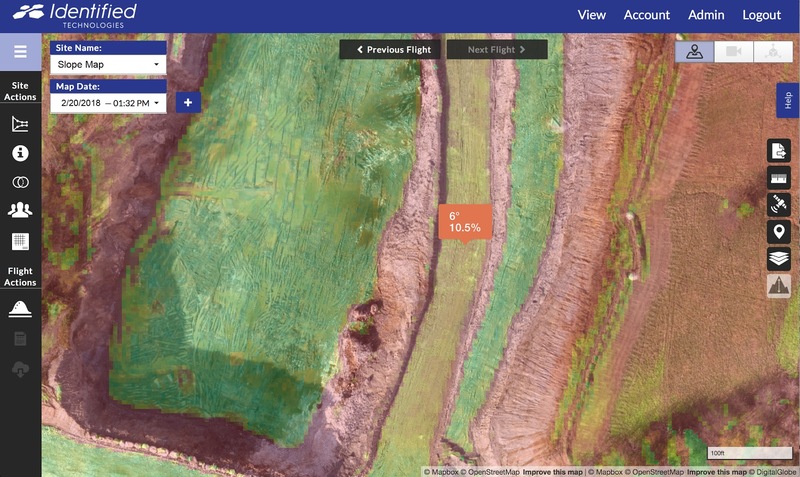 Plan IQ Camera View - Provides a livestream of what the camera sees when the drone is flying. This is particularly valuable for maintaining continuous line of sight on the drone as it flies, as required by the FAA regulations. Change Detection Tool Color Coding - Empowers users to change the colors in this tool so they can color code piles of different things and measure change accordingly. Enterprise Site Permissions - Gives users more control over shared data, so they can customize the level of access and control they want to grant individual customers, contractors, and stakeholders. DJI Inspire 2 Drone - Customers will receive upgrades to the new DJI Inspire 2 with their Identified Technologies subscription. The Inspire 2 has enhanced accuracy, robustness and obstacle sense and avoid (SAA) capabilities. 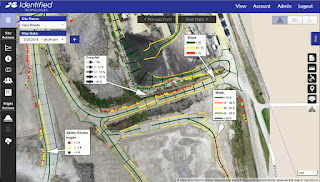 The most dramatic changes to Identified Technologies’ Site IQ software capabilities are the Haul Road Analysis and Slope Map features. For these quickly constructed and heavily trafficked dirt roads, steep slopes result in dramatic increases in gas consumption and costs, accelerated wear and tear on vehicles, or exacerbated hazards from ice and inclement weather. Going from .02 % to .01% slope doubles the fuel efficiency of the vehicle traveling on it, as it is documented that a 10% change in slope can affect the fuel efficiency by 10%. Given this fuel efficiency, a single large piece of equipment on a less steep slope could save a company $400,000 in fuel over a three-year project. Identified empowers companies with the ability to track progress on highways, well pads, mines, and landfills in near real-time. Identified’s integrated software and services takes care of everything from FAA compliance and flight planning to advanced analytics. Learn more at www.identifiedtech.com. RETTEW has purchased Enviroscan based in Lancaster, PA. The transaction joins the specialized geophysics services of Enviroscan with RETTEW’s engineering, surveying, and environmental consulting business. Geophysics is the science of detecting and mapping underground or underwater hidden objects and features. Enviroscan specializes in non-destructive, non-intrusive investigations to make digging, drilling, or earthmoving faster, safer, easier, and less expensive. The geophysics services will integrate directly into RETTEW’s existing earth sciences services, which include geotechnical, environmental, water resources, and subsurface utility engineering investigations. Formed in 1992, Enviroscan is a certified women-owned business enterprise. All employees, including principals and corporate owners, will work from RETTEW’s offices in Manor Township, Lancaster County, PA. Enviroscan will operate as the geophysics service area under the RETTEW brand name. RETTEW began providing civil engineering and surveying services in 1969. Today the firm has more than 350 employees and 11 offices in Allentown, Conshohocken, Lancaster, Mechanicsburg, Pittsburgh, State College and Williamsport, PA; St. Clairsville and Uniontown, Ohio; Bridgeport, WV; and Denver, CO. For more information, visit www.rettew.com. A new ASTM (American Society of Testing and Materials) International standard supports geosynthetic cementitious composite mats (GCCM), a new family of materials that can help control erosion, protect slopes and berms, and line ditches and culverts. The new standard (D8173) identifies proper layout, installation, and hydration procedures for GCCM. It also describes equipment for designers, inspectors, and installers and provides a checklist for contractors to use before installations. “This standard provides details on fastening, overlapping, attachments, anchoring and other topics critical to good GCCM installation,” says ASTM International member John Paulson of Dison Contracting and Supply, LLC. “The new standard will help minimize or eliminate common mistakes that may be made by a first-time installer.” Paulson notes that because GCCM is unique to geosynthetics and erosion control applications, the committee hopes to develop more standards related to testing, installation, and classification. Anyone is welcome to help create these standards. Become a member at www.astm.org/JOIN. To purchase standards, contact ASTM International customer relations at 877-909-ASTM or sales@astm.org. ASTM International develops standards to positively impact public health and safety, consumer confidence, and overall quality of life. They integrate consensus standards developed with its international membership of volunteer technical experts and innovate services to improve lives and help the world work better.